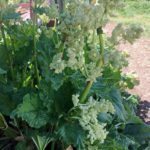 Can I harvest rhubarb after it has seeds growing at the top of each stalk? They are already full of seeds in May. And now I'm not sure how to treat the plant. This is the 2nd year growth.